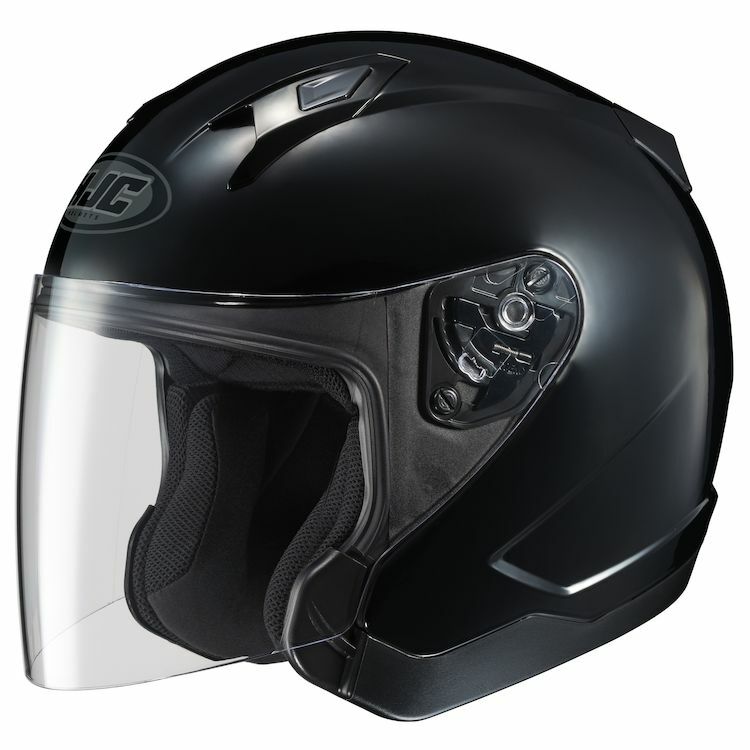 HJC CL-Jet Helmet has crisp modern styling and a full face shield for blocking some of the wind but it still allows for a decent amount of ventilation especially when paired with intake and exhaust channeling that runs through the helmet. Bought this as an upgrade over an HJC CL-33. Wanted the drop down sunglasses/visor as I'm a rider with glasses and would like to have the option. 2) Weight. Feels light but at the same time does not feel cheap or unsafe. Very solid, well built. The venting works well and the wind doesn't rattle my head around like the CL-33. My only 2 complaints? It's a tight fit. the XL I ordered is rather snug around the cheeks and jaw, which is a good thing, but it does make it difficult to remove unless I take my glasses off first and does get a little painful around the ears. This will hopefully alleviate as time passes. To be honest, the XL I have in the CL-33 feels like it's swimming on my head in comparison to the Jet. this helmet is not expensive so its tough to complain. worth mentioning though is that i'm disappointed with the airflow. i watched the revzilla video b4 i bought this and thought that the airflow would be great. he even said good 4 those that live in a hot climate (i'm in SC). lastly the vents towards the top that have the plastic click button for open/closed is really cheap and doesn't open or close the vents completely. Fits well. The visor stays up when you want to leave it up. I like the groves in the side to let my glasses fit through. Light weight a step up from a half helmet for sure. Obviously if you fall at speed in a 3/4 or 1/2 helmet you will grind your face off so buy this one for scooting around town on a, er, scooter or your favorite city bike. More convenient than a full face for little low speed trips. I'm a long oval head shape and it fits me relatively well. It's always hard to find true long oval shapes and this is as good as it gets I would say. My full face helmet is an Arai Signet Q and it fits similarly if that helps. Happy with the helmet overall, and would buy again. I measured my head and ordered according to the chart. Fits nicely. I've own HJC Helmets before great helmet for the money and great fit and love the style and I ordered from Revzilla because they are great to deal with and the super fast shipping. Price. Features. And I want to help Anthony buy another shirt. Poor dude is always wearing that purple one in all the videos. Great 3/4 helmet for beginners, especially for slow speeds and learning in parking lots. I have had HJC helmets in the past and feel that they are a good brand with a quality product. This helmet has the options that I am looking for. However I do not like black but I don't have a choice in this case. I chose this helmet because, number one, it fits my head shape (I wear an Arai Profile full coverage helmet), number two, the price was right, and number three, Revzillas return policy is very good. The helmet fits like it's supposed to, so I didn't need to send it back, but I have all the confidence that I'd be able to send any merchandise back, no problems. Great company to deal with! I'm look for a 3/4 helmet. I'd buy one from HD XXL. Wore it for a few hours too tight on my head. Gave my a Hugh headache. I do where a 1/2 with no shield and that's a xl fits great. ( that's what I want for the 3/4 the shield and to use intercom to talk to wife). Had my wife measure my head like you said. it was a 233/4 to 24. What should I be looking at. Also the 3/4 I have tried hurt the side of my face and ears big time.?? Help please?? BEST ANSWER: I measured my head as instructed. It's 57cm. According to the size chart, it is medium size. Therefore, I bought the Medium size HJC CL-Jet Helmet. It's too tight and hurt my head. I exchanged to Large size. It fit perfectly. Does this helmet fit like the HJC CL-33? It's time for me to replace my 1st helmet, and I haven't found one that fits my head like that.